This besan ladoos are basically Maharashtrian dish. its main ingredients are chickpea flour, powdered sugar, and ghee. It is a very simple traditional festive dish. yet having fewer ingredients it is so tasty dish. it must be made at so many festivals in India. and everyone loves these besan ladoos so much. total no of ladoos made: 20.
dry fruits as you like almonds, cashew nuts, raisins for garnishing on top. 1. In a heated pan, add in ghee. 2 when the ghee gets tempered, then add chickpeas flour into it. 3. then roast it until golden brown gently and continuously. 4. when besan get roasted nicely then, take the mixture out in a bowl and add in powdered sugar and cardamom powder. 5. mix it well, make sure all the ingredients are well incorporated and scoop out small portions of the mix. 6. Roll it into small balls. 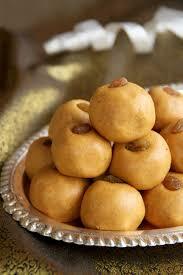 7. roll all the balls twice so that it gets a nice shape and top with dry fruits as you wish. 8. if at the time of making ladoos it becomes somewhat sticky, then don't worry as time passes it gets some dried and not sticks.